BT’s trial of the technology builds on its previously demonstrated ‘Superchannel’ concept which achieved record-breaking speeds of 5.6Tbps last year by combining 200Gbps wavelengths of light into a single optical fibre. BT, together with industry partner Huawei, has now developed a technique which combines multiple 400Gbps wavelengths over a single fibre. Using this new technique, BT’s researchers are confident that speeds of more than 13Tbps can be achieved using the same amount of light spectrum as the previous record. These speeds are the equivalent of downloading up to 500 HD films in a single second. BT’s latest Superchannel concept is based on the ultra-efficient use of light carried over optical fibre – so-called ‘spectral efficiency’. The trial demonstrated that it’s possible to transmit multi-terabit speeds over the UK’s core networks with stable, long term, error free performance, and an unmatched 6.25bits/s/Hz - the most efficient achieved on a real-world fibre link using production-grade hardware and software. The technology was trialled on a live fibre-optic ‘loop’ between the BT Labs at Adastral Park, Ipswich and BT’s Bishops Stortford Exchange over a distance of 250km. BT is demonstrating the optical network technology at its Innovation Week 2017 event at Adastral Park which runs from 12 – 16 June. 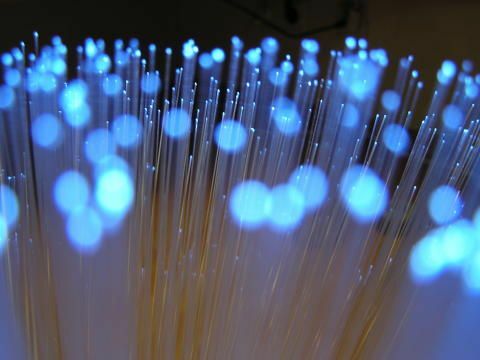 “This trial proves that we can release even more capacity from fibre optic infrastructures by further boosting the efficiency of light transmitted over a single strand of glass. It builds on our record-breaking speed achievements over the last couple of years - transmitting 3Tbps and then 5.6Tbps over a single optical fibre, and running the first 2Tbps Superchannel in our live network. “Widespread adoption of HD and 4K streaming TV services is driving nearly 50 per cent annual growth in demand for bandwidth. We expect this trend to continue as new technologies like Virtual and Augmented Reality become more common, so this research is essential to keep the UK ahead of any potential future network capacity crunch. The BT Labs in Martlesham, Suffolk, is one of the world’s leading telecoms research centres, and the UK’s main hub for the development of communications technologies. The Labs have been central to the development of fibre-optics since the 1970s, building the world’s first commercial fibre network in 1984.